This butterfly, from the Latin American Rain Forests, flashes a spectacular iridescent blue when in flight. When it lands, it usually puts on the camouflage. 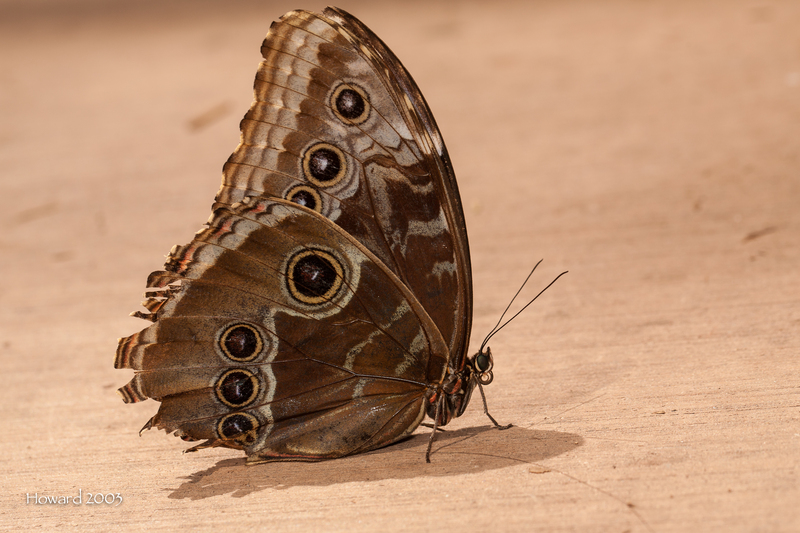 Here we see what the Blue Morpho looks like with wings extended and with wings closed. DId you take these? Where? How fun! Oh, I see in your tags! I started to put the place (Butterfly Wonderland) in the text then opted for the tags. And yes, they are my shots. I am focusing on taking pictures of butterflies right now because I think this is a good way to practice basic camera skills (and because they are so beautiful). Wow! How beautiful is a butterfly with different colours and patterns back and front! And I liked looking for the scales – I never knew about them. I didn’t either Trish … know about the scales or this butterfly. They are fascinating creatures. Thanks, David. I hope that you have a blessed day.